From a top 25 ranking to joining a new conference, fourth-year wide receiver Sam Coleman recently finished his collegiate career with one of the most exciting seasons in the history of UChicago football. In the squad’s first year playing in the Southern Athletic Association, Coleman led the team to a 6–4 overall record, 5–3 in conference. In the 2015 season, Coleman earned First-Team All-SAA and First Team All-UAA honors. 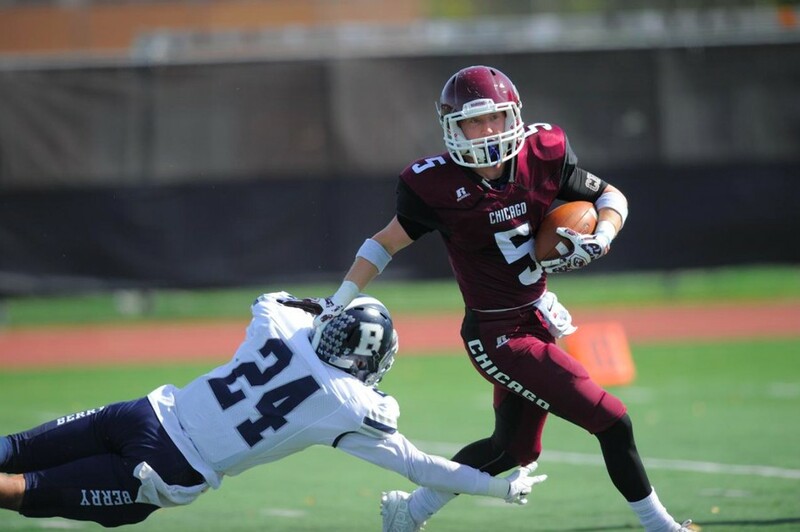 He was the offensive motor for the team, leading the Maroons in receptions with 45, receiving yards with 797, and yards per catch with 17.7. He added nine kick returns for 288 yards, and six touchdowns on the season. Additionally, Coleman was named the team’s MVP at the annual banquet at the conclusion of the 2015 season. Coleman’s best memory of his senior year is the 31–0 Senior Day victory over Sewanee at home, at which Coleman and his 13 classmates were honored. The senior class ended its four years with 24 wins, the second highest win total in the modern days of Maroon football. “The best football moment this past season had to be Senior Day. It was the last time playing on Stagg Field, and it was great to have my family there for that day. Also, it was a great moment for the seniors, as we were able to take a second and reflect on all the hard work we had put in over the last few years,” he said. Coleman, a public policy major, will leave the South Side with nothing but fond memories of his time as a student-athlete. With ambitions to attend dental school and a job lined up next year to work in a dental lab back home in Alabama, it’s clear that he took advantage of his time in the classroom as well. Coleman’s influence on Chicago athletics extended beyond the field, as he has been involved in the Order of the “C” throughout his four years. The organization works to support the role of athletics at the University. Coleman, who started playing football in second grade, looks back on his experience on the field and leaves a word of advice for the athletes he leaves behind. “Have fun with it. Athletics here for me was a great escape from the stresses of class or worries about the ‘real world’. It may seem as a grind at times, but if you can always have fun with it, I think you’ll get the best experience,” he said. As Moser mentioned, the team will have big shoes to fill next year.